Offering stylish units with modern dark wood interiors, Golden Tulip features an outdoor pool with poolside dining and a bar. 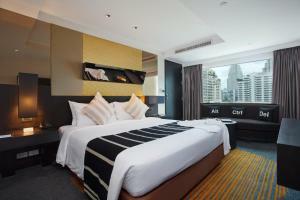 Located on Sukhumvit 20, the hotel provides free Wi-Fi and shuttles to Asoke BTS Skytrain Station. City skyline views can be enjoyed from floor-to-ceiling windows. Featuring dark colour schemes and warm lighting, the spacious rooms have a flat-screen TV, DVD player and large bath areas. 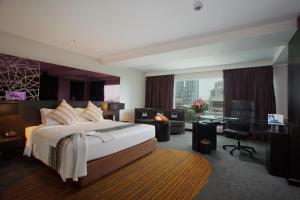 Golden Tulip Mandison Suites is a 10-minute walk from Emporium Shopping Mall and has free parking. It is a 10-minute drive from Queen Sirikit Convention Centre and the Bumrungrad and Bangkok hospitals. Regular workouts can be maintained at the gym or outdoor pool. 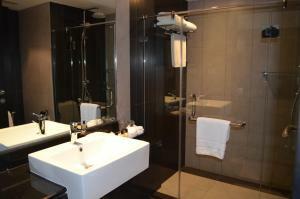 The hotel also provides personalized concierge services and meeting facilities. The OPIO lounge restaurant offers a variety of Thai and Mediterranean dishes by the poolside. Meals can be served in private dining pavilions or in guest rooms. This fully furnished room includes sound proof equipment, free Wi-Fi, and a sofa or living area and working table. 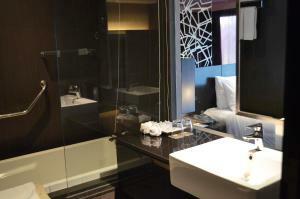 Rate: THB 2451.00 ... THB 4225.00; select dates below to get current rates. This spacious suite features a custom-built study area. 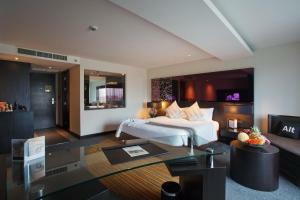 Rate: THB 2852.00 ... THB 4100.00; select dates below to get current rates. Air-conditioned room offers a sofa seating area, a satellite TV with a DVD player and an en suite bathroom.